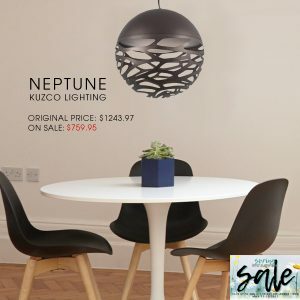 Posted April 1, 2019 by Norburn Lighting and Bath Centre & filed under Sales and Promotions . Norburn Lighting and Bath Centre will be having a No Tax Sale from April 11-13, 2019. 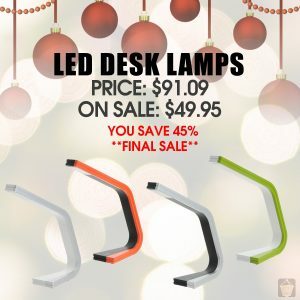 Posted January 6, 2018 by Norburn Lighting and Bath Centre & filed under Sales and Promotions . We’re bringing back our NO TAX sale event on January 25 to January 27, 2018. 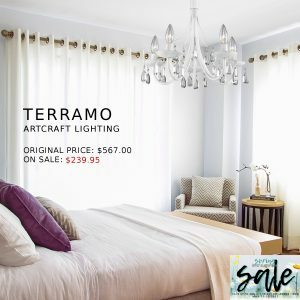 Transform your home and save on absolutely everything at our Burnaby showroom, from chandeliers, pendants, sconces, portable lamps, ceiling fans, energy efficient lighting options, and plumbing items. Our No Tax Sale runs for 3 days only, so don’t miss out! Posted September 1, 2017 by Norburn Lighting and Bath Centre & filed under Portable Lamps, Sales and Promotions . It’s officially September which means Back to School is just around the corner, and only 16 days left of our Perfectly Portable Sale! This desk lamp from Kendal Lighting has a minimalist design available in polished nickel, satin nickel, and antique brass. The lamp features a lever near the neck of the lamp to adjust the angle of light, and an on/off switch on the base. This desk lamp is another classic design by Kendal Lighting that is available in satin nickel, oil rubbed bronze, and chrome. This lamp has the same swivel lever feature to adjust the angle of light, but has a flatter shade and a dial switch on the base. The Cerv LED Table Lamp from Kendal Lighting has a sleek contemporary style, finished in chrome with white acrylic. The light output can be adjusted using the touch control on the base, which offers three light levels. This Compact LED desk lamp from Dainolite has an adjustable head, and a touch dimmable switch on the base including a night light feature. Available in a matte black finish. 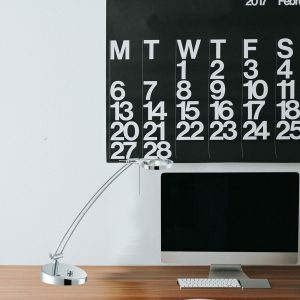 The Flat LED desk lamp from Modern Forms has adjustable arms that can be folded when it is not in use, perfect for counter tops, desks, and other work surfaces with limited space. This desk lamp is fully dimmable, with fingertip touch technology. Inspired by balance and stability, the Disc LED desk lamp from Modern Forms has a fingertip touch dimmer, and is available in a black finish. The Suspension from Modern Forms has 180 degree adjustable arms which also makes it ideal for those with limited space. 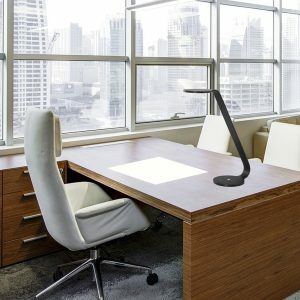 The desk lamp has a fingertip touch dimmer feature and a USB port for recharging electronic devices. This lamp is available in a black finish. 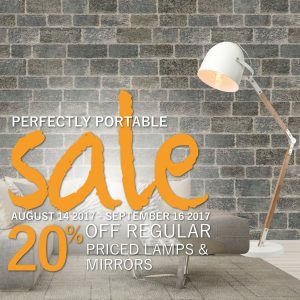 For more portable lamp options or to find out what other items are part of the Perfectly Portable Sale, contact or visit our showroom. Our Specialist are always happy to help! Posted August 14, 2017 by Norburn Lighting and Bath Centre & filed under Portable Lamps, Sales and Promotions . We are preparing for the changing season ahead with our Perfectly Portable Sale which will run from August 14 to September 16, 2017. 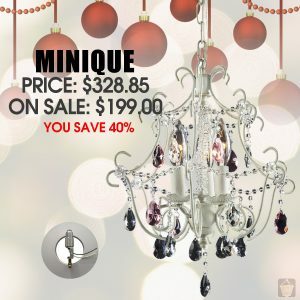 All regular priced lamps and mirrors will be 20% off for this limited time. So what makes portables so great? Lamps can soften shadows and provide ambient lighting for conversation or when reading. 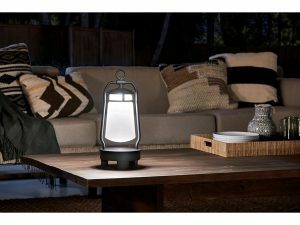 For instance, the LED Outdoor Lanterns with Bluetooth Speaker from Kichler offers ambient lighting that is dimmable and serves as an output for music when entertaining guests, or simply relaxing outdoors. Image Source: Kichler Lighting, LED Outdoor Lanterns with Bluetooth Speaker. 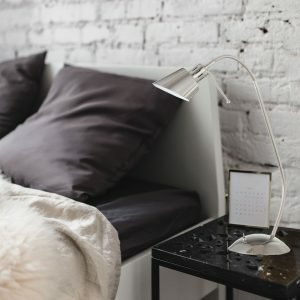 Portable lamps give the option to add a layer of light to a room without having to rewire which can be costly and unconventional for some homeowners. This is especially the case for older homes that bring up hidden costs of installing a new fixture which may require more work. In addition, portable lamps are also useful for providing task lighting for sewing, reading, or writing. The Valeo Floor Lamp from Cerno can offer ambient lighting to a space as an alternative for a fixture. 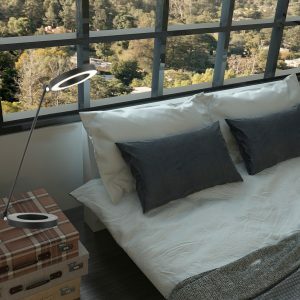 The floor lamp is almost 8 feet tall and has an adjustable shade that can be lowered. Image Source: Cerno Lighting, Valeo Floor Lamp. Portable lamps are made of durable material but are not fixated to a single spot. Portable lamps can be moved to different areas or rooms that require an additional layer of light or a decorative element. 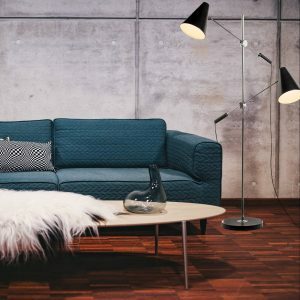 This 2-Light Floor lamp from Dainolite has adjustable arms for versatile use, and has a mid-century modern aesthetic. Portable lamps are also a great way to experiment with different styles to create a statement. Some lamps have replaceable shades which can enhance its visual appeal or match current decor. 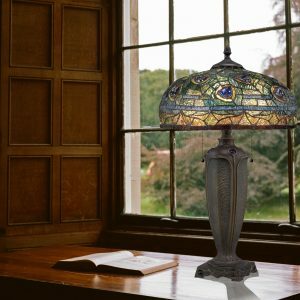 Portable lamps can also be a statement in and of itself, such as oversized floor lamps that can serve as general lighting for a room due to its scale or ornate lamps such as the Lynch Tiffany Table Lamp from Quoizel that has an intricate detailed glass shade. Table and Desk Lamps take minimal space, and also creates the illusion of a larger space when they are positioned in certain areas. 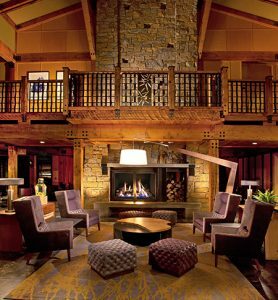 For instance, when lamps are next to a wall such as when they are on top of a buffet or side table, they create a surface of light that makes the space appear larger. This is ideal in living rooms, dining rooms, and foyers where buffet and side tables are commonly used. 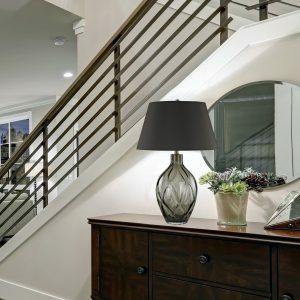 The Saga Table Lamp from Dimond Lighting has a chocolate faux silk shade and a complimentary chocolate smoke glass base that provides the added illusion of a larger space. For more information on our Perfectly Portable Sale or to find out what portables are up for sale, contact or visit our showroom. Our Specialist are always happy to help you! 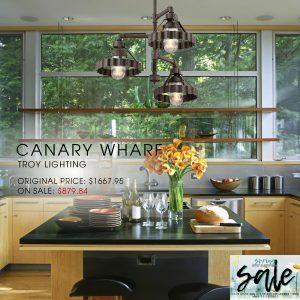 Posted May 9, 2017 by Norburn Lighting and Bath Centre & filed under Sales and Promotions . 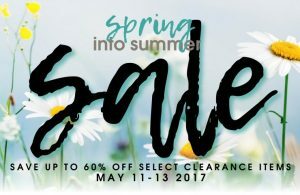 Save up to 60% off on select clearance items during our Spring into Summer sale starting May 11 till May 13 2017. 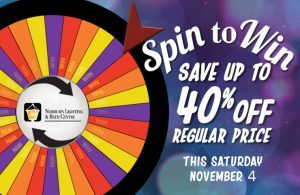 Plus receive 20% off regular price items, and save on select clearance fans. 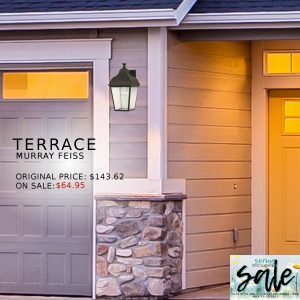 The Terrace is made of seeded clear glass with an oil rubbed bronze finish. Lamping: (1) Medium A19 150w Max. The Terramo is embellished with crystal droplets and is finished in white. Lamping: (5) 60 watt Candelabra. The Keinilworth is finished in silver leaf and has a glass diffuser for a softer output of light. Lamping: (4) Medium 100w Max. 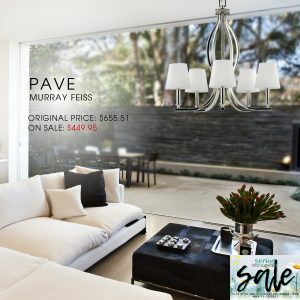 The Pave is designed with crystal inlays and has a polished nickel finish. The chandelier is topped off with white shantung silk shades for a crisp and contemporary look. The Canary Wharf is in a Burnt Sienna finish and provides a rugged industrial look. Lamping: (3) E26 Medium Base 60w Max. The Neptune has a laser cut design that creates interesting shadows, and is finished in bronze. Offer ends May 13 2017 and while quantities last. Visit our showroom to see more items up for sale, our Lighting and Bath Specialist are always happy to help you! 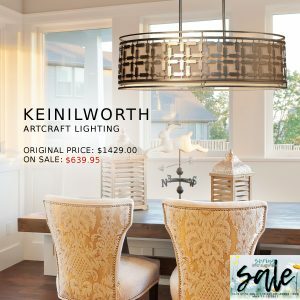 Posted January 16, 2017 by Norburn Lighting and Bath Centre & filed under Sales and Promotions . Help us make room in our showroom, and save up to 70% off on select items. 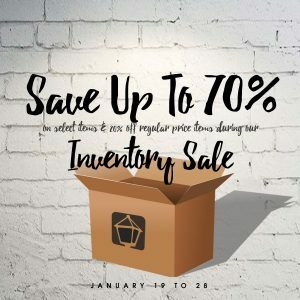 Plus, all regular price items will be 20% during our Inventory Sale from January 19 to January 28. 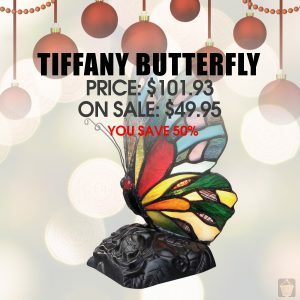 Don’t miss out on some amazing deals! 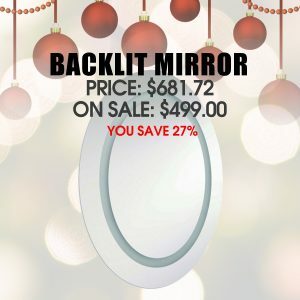 Posted December 16, 2016 by Norburn Lighting and Bath Centre & filed under Sales and Promotions, Tips and Advice . 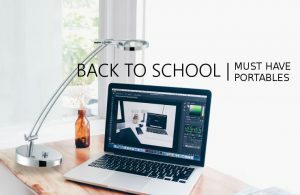 Sleek, modern, and functional, these LED Desk lamps play with colour blocking and designed with a swift touch on/off button. 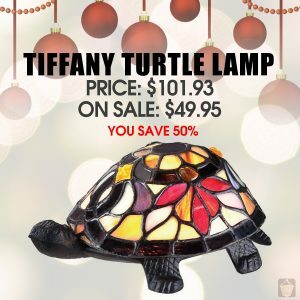 These Tiffany lamps are designed with coloured glass that bring a hint of whimsy, and make for a great conversation starter. For the hockey lover in everyone. 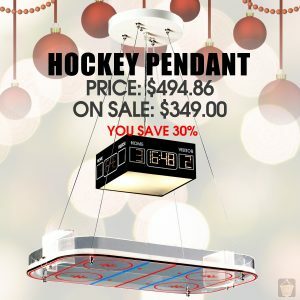 This novelty hockey pendant will certainly draw a crowd! 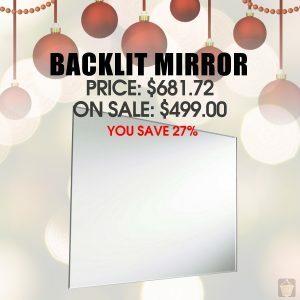 Backlit mirrors help eliminate shadows on the face when shaving or applying makeup. 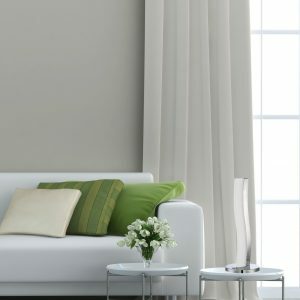 The minimalist design also makes it perfect for any home. Swingarm mirrors provide precision, especially when grooming and applying makeup. 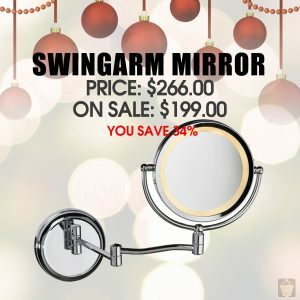 The swivel arm also allows the mirror to be tucked away when it is not in use. 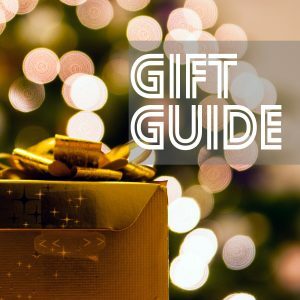 Gift cards are ultimately the ideal gift when you are not sure what someone would like, or if you are simply running out of time! 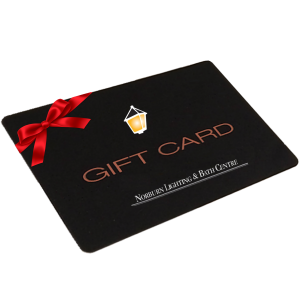 Our gift cards work for any budget, and allows the person to make the final decision on what gift they want. 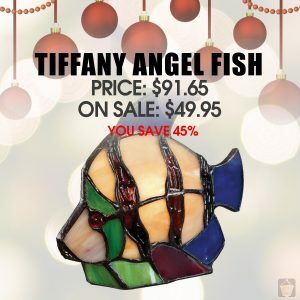 Contact our showroom for more gift ideas, and for product availability.